This will help you “get yer Fall on”! Clean and dry the chicken. Put the dry rub, several slices of garlic, and a few sprigs of basil under the skin of the chicken. Place 1 lemon (quartered), 3-4 dried chipotles; several sprigs of fresh basil and 4-5 sliced cloves of garlic in the cavity of the bird. Combine juice of 2 lemons and the olive oil and rub the outside of the chicken. Keep remaining oil, add a bit of honey and use to baste during cooking. Chop carrots, potatoes and onions and toss them in olive oil and some dried herbs (oregano, basil, black pepper). Put chicken in a roasting pan and place veggies all around. 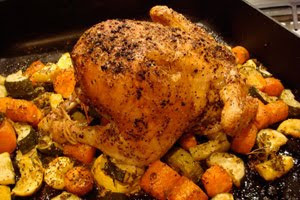 Roast until chicken is cooked, basting periodically. If you want to add a salsa – use a can of green chiles, chopped dried chipotles, black pepper, salt, chopped onions, chopped tomatoes, chopped garlic; and a bit of chipotles in adobo sauce. Cook over low heat for 15 minutes until it has the consistency of a chutney. Serve chicken and veggies with salsa and fresh sliced avocados.